Jesse Eisenberg, Erin Darke, Michael Zegen, Annapurna Sriram, Kunal Nayyar. Photo by Monique Carboni. Jesse Eisenberg and Kunal Nayyar. Photo by Monique Carboni. 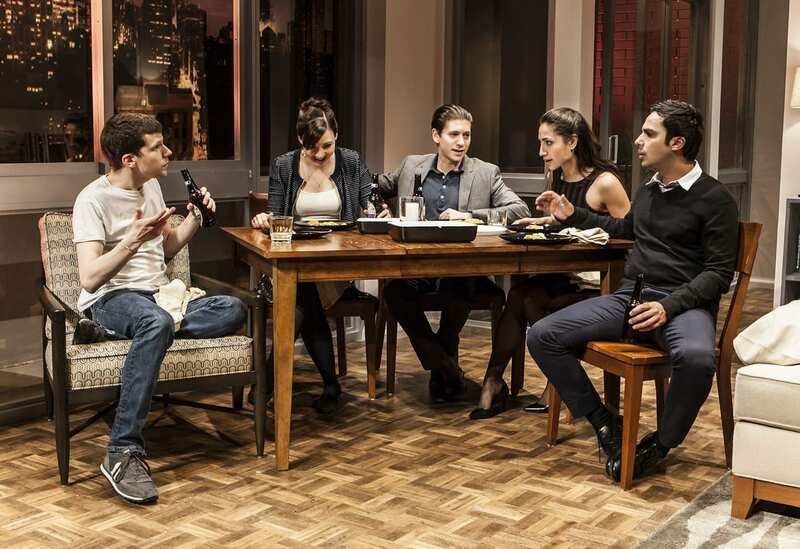 If you’re looking for a fast-paced comedy that flies by, you’re in for a treat with The Spoils. Ben (Jesse Eisenberg) lounges around all day in his fancy apartment, chatting with his roommate, drinking, and doing absolutely nothing except occasionally working on his film. Under the direction of Scott Elliott, Ben truly shows what a procrastinator he is. He sits with his feet up on the couch and wears the same white t-shirt all day/evening long. His dad paid for his expensive apartment, so Ben has all the time in the world to do whatever he wants. He confides his deepest thoughts in his roommate Kalyan (Kunal Nayyar) and has a “best friend” kind of relationship with him. Their friends joke that they argue like an old married couple. Kalyan comes from Nepal and has received a scholarship at the NYU Stern School of Business. He’s dating Reshma (Annapurna Sriram) and we immediately see how Ben and Reshma don’t see eye-to-eye. When Ben runs into his elementary school friend Ted (Michael Zegen), he finds out that Ted is engaged to Ben’s only true love back from school, Sarah (Erin Darke). Ben laments how the world is unfair when he realizes he can’t marry his crush. Ted is working on Wall Street with a successful career and Sarah is teaching math to people who have been arrested. It’s quite fun to watch the interaction with Ben and Ted, as Ted is dressed in more expensive clothes and acts like a smooth car salesman, whereas Ben doesn’t have any job at all. Ben says working on Wall Street is boring, but we see how Ben secretly wants attention from everyone else and feels like the whole world is passing him by (as others get married, go to graduate school, get high paying jobs, etc). Soon everyone gets together for a dinner party at Ben’s apartment. Everyone else is dressed up, but Ben is still wearing the same white t-shirt to dinner. He truly embodies his character and shows you what a slacker he is. Meanwhile, Kalyan starts dinner with a Powerpoint presentation of all the food they’re about to enjoy (Kalyan loves making a Powerpoint on any topic imaginable.) Some fireworks result (quite understandably since Ben has a knack for always saying the wrong things and pushing peoples’ buttons); everyone except Ben decides to go out drinking for the night. We see the film that Ben’s been working on in the second act when he screens it for Sarah. The popcorn scene elicited hearty laughter from the audience. It’s comical to watch how the older well-dressed lady shoos her dog away from eating in the garbage, and we see the homeless man laying right next to the food as well. Some surprises come out about the film, and this causes a clash between Ben and Sarah. As his world starts to fall apart even further, Ben continues to alienate the people who are closest to him in his life, one at a time. Screaming and fights follow, as all the tension under the surface boils over. Jesse Eisenberg gives a five-star performance; his character will stay in your mind long after the show is over. 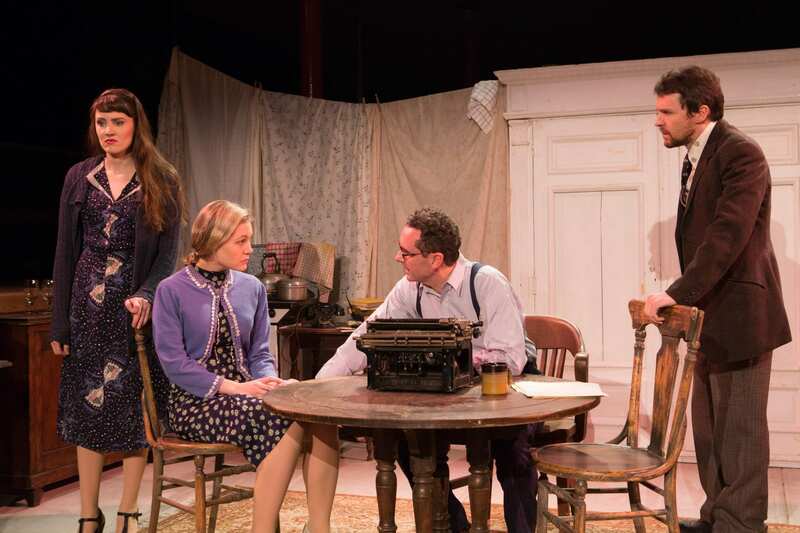 The Spoils – Presented by The New Group in association with Lisa Matlin. Written by Jesse Eisenberg; directed by Scott Elliott. 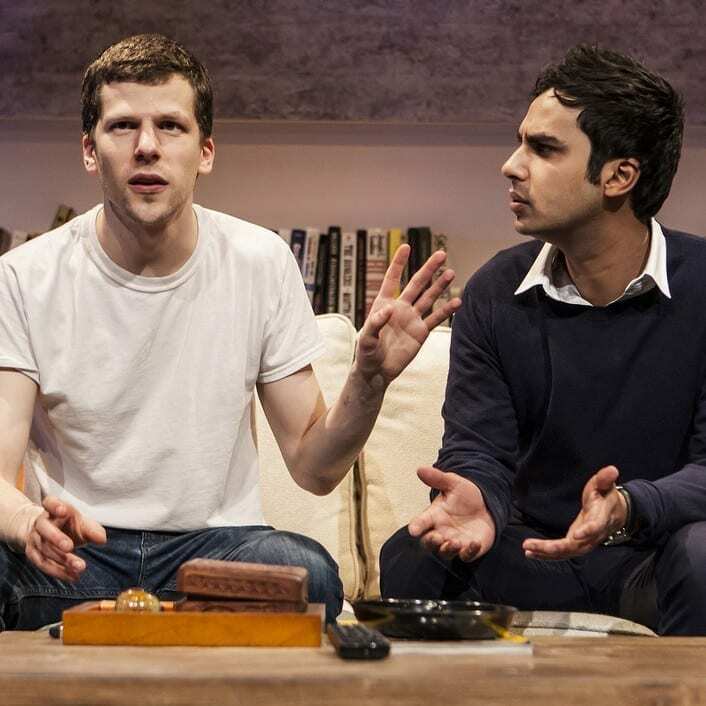 Cast: Erin Darke as Sarah, Jesse Eisenberg as Ben, Kunal Nayyar as Kalyan, Annapurna Sriram as Reshma and Michael Zegen as Ted. 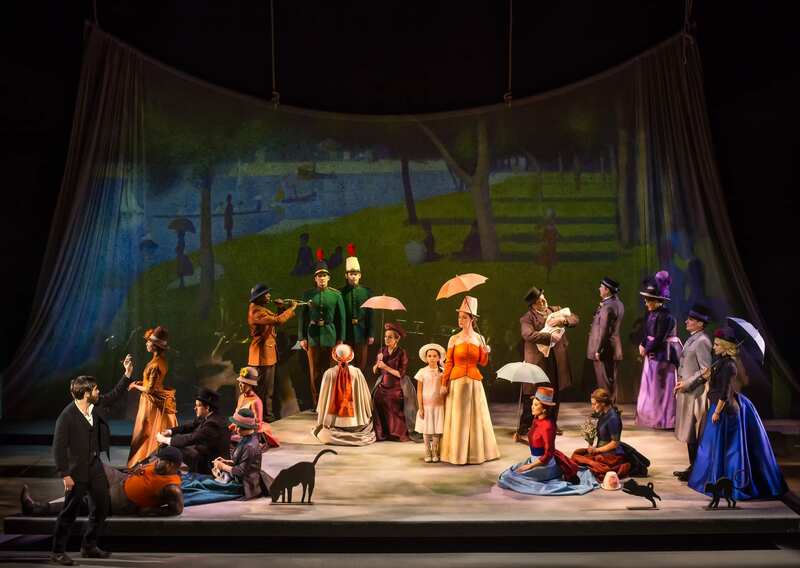 Set Design by Derek McLane, Costume Design by Susan Hilferty, Lighting Design by Peter Kaczorowski, Sound Design by Rob Milburn & Michael Bodeen and Projection Design by Olivia Sebesky. The New Group at The Pershing Square Signature Center (The Alice Griffin Jewel Box Theatre, 480 West 42nd Street), www.signaturetheatre.org and www.thenewgroup.org, through June 28. Running time: 2 hours 35 minutes including intermission.